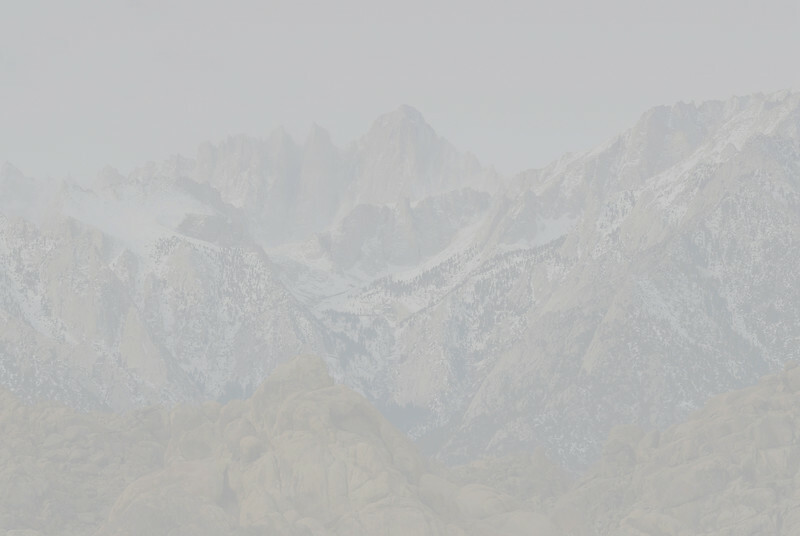 If I had to work in just one state forever, this would be it. 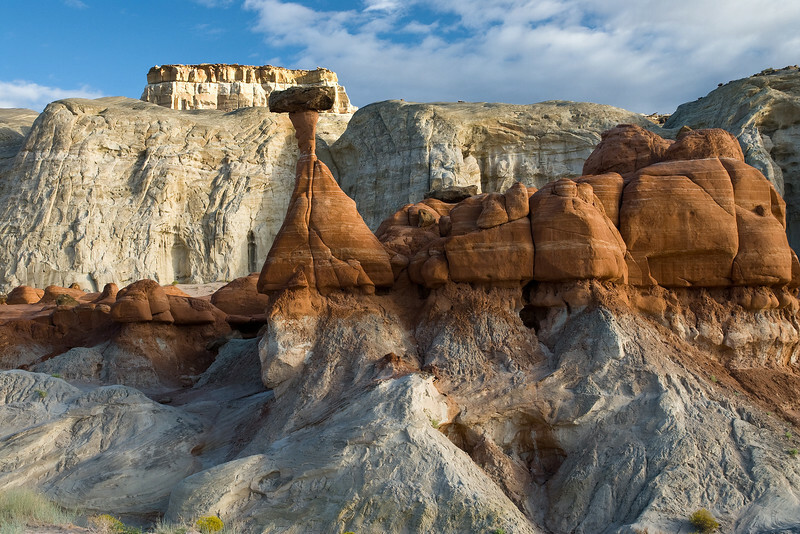 Late afternoon sunlight sweeping across the swirling textures and odd shaped hoodoos of eastern Zion. 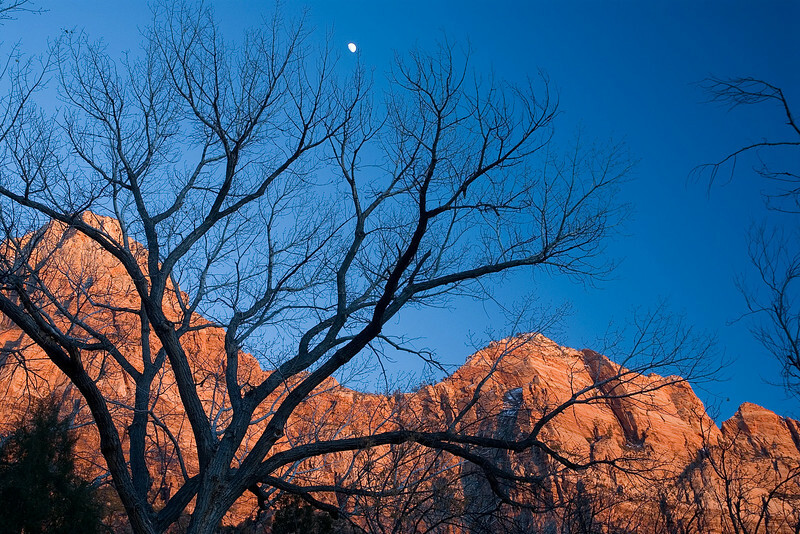 Alpen Glow-magic light occuring just at or after after sunset- on the red rock peaks in Zion National Park, seen through the bare winter branches of some cottonwood trees on a January evening. 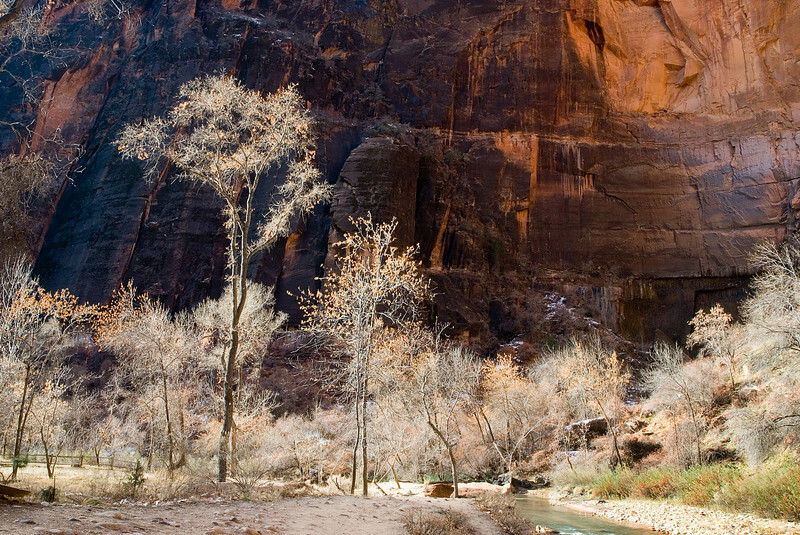 Bare trees glow in the early morning sun against the sheer, colorful walls of Zion Canyon as the Virgin River trickles by. 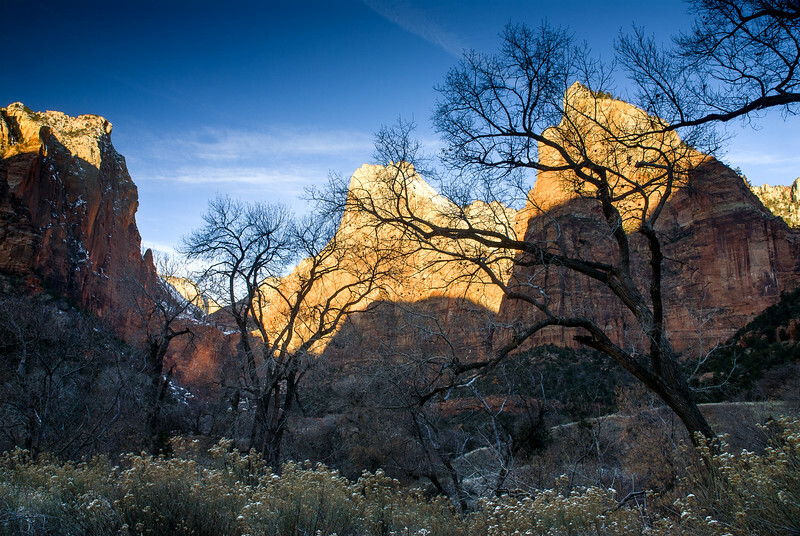 Dawn light on the The Court of the Patriarchs in Zion Canyon. 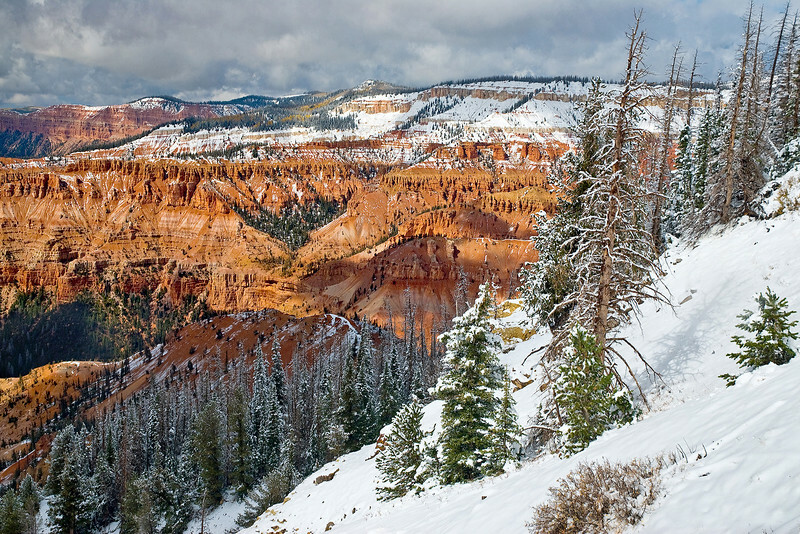 I was shooting foliage in the Cedar Mountain area when an October storm turned to snow at the highest elevations, covering Cedar Breaks in an unexpected blanket of fresh white powder. 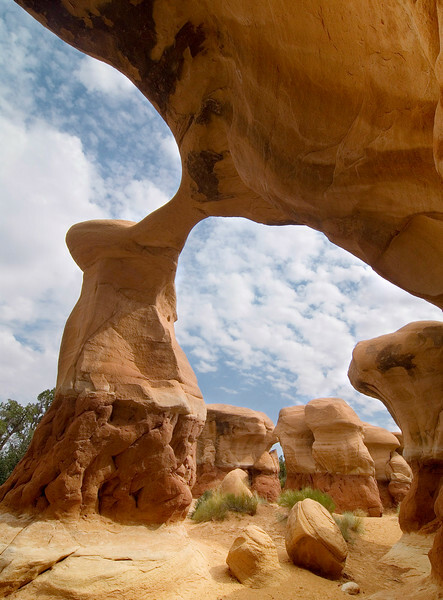 A side-angle angle of Metate Arch from directly inside the arch, with other interesting rock formations of the Devil's Garden standing by in the background. 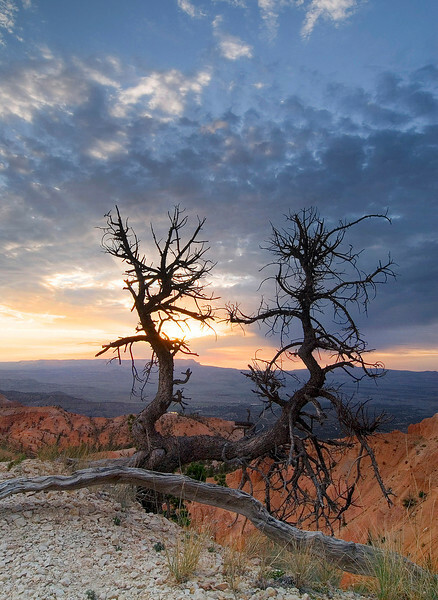 A colorful sunrise at Bryce Canyon, framed by the remains of some wonderfully gnarly looking trees. 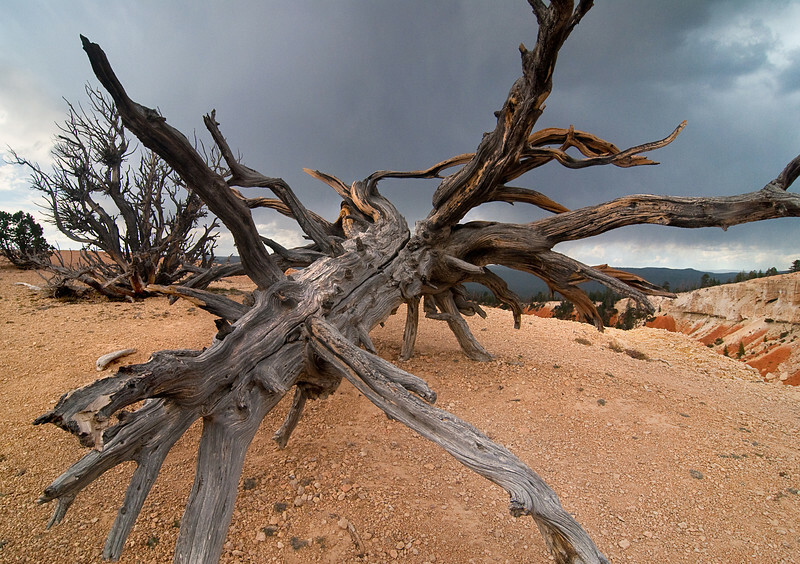 I found the remnants of these Bristlecone Pines on a stormy day at Bryce Canyon. 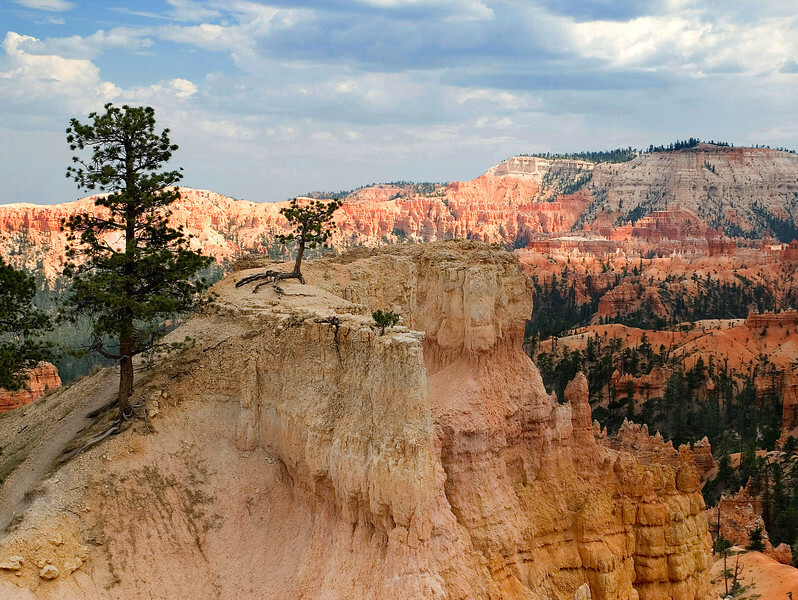 They reside in the highest part of Bryce, near Rainbow Point at the south end of the Canyon. 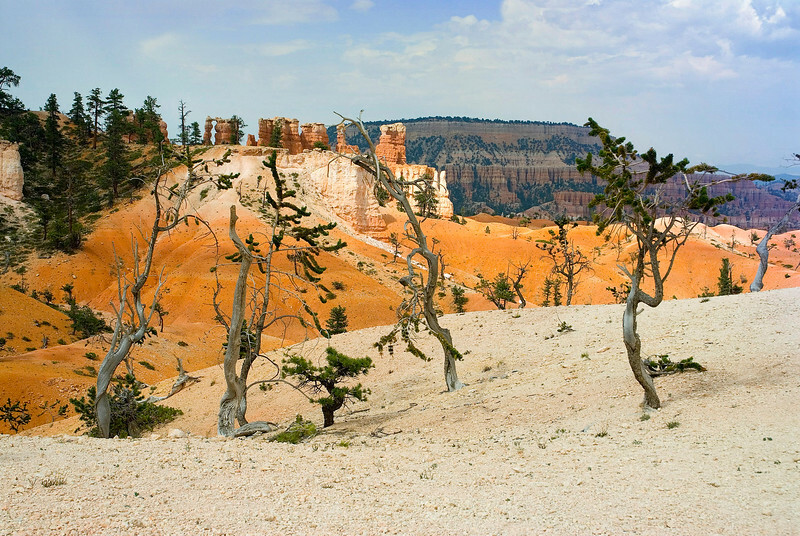 Besides the purely beautiful colors, this scene caught my eye because of the way the shape of this tree is echoed by the curving formations of the canyon wall in the background. 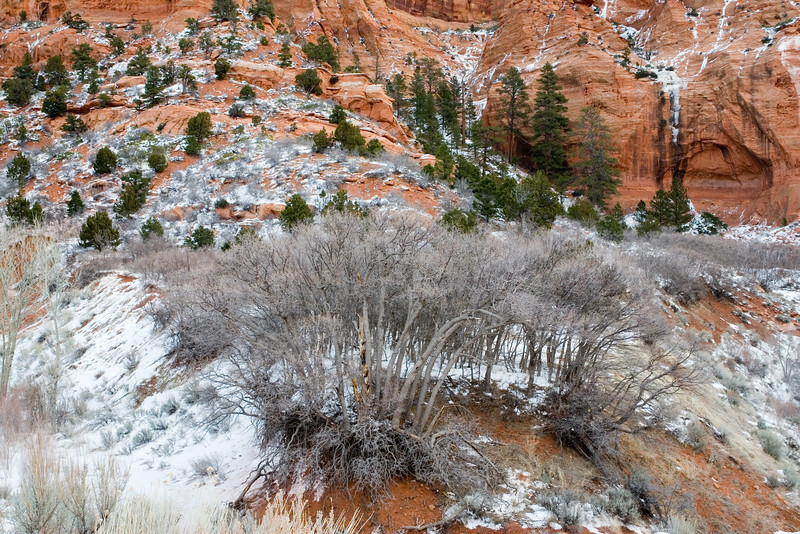 Bare trees, evergreens and snow punctuate the complex textures and deep red red of this canyon wall in Utah. 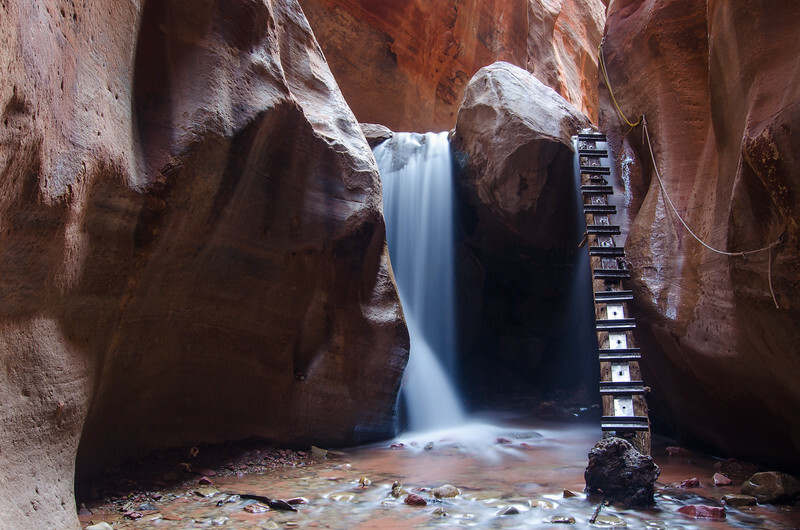 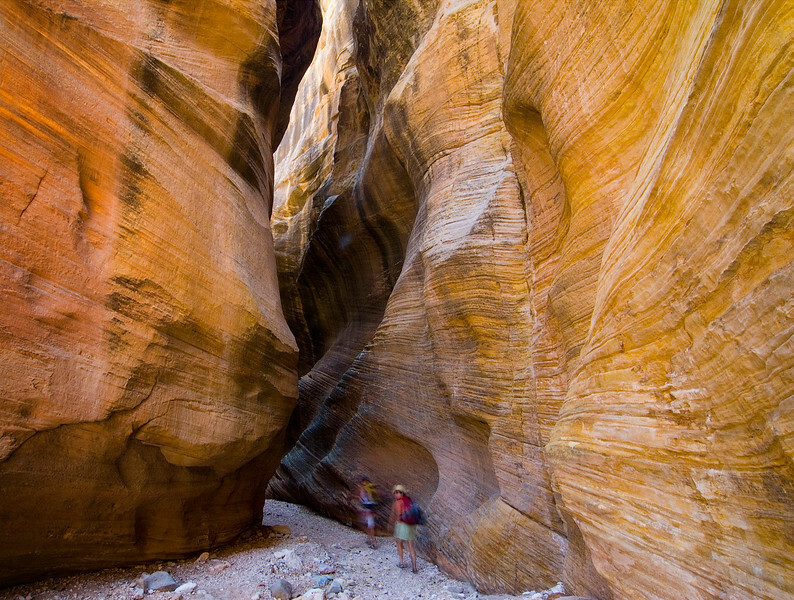 Thousands of years of rushing water has carved sections of these canyons into wildly painted tunnel-like shapes, while the sheer walls rise to dizzying heights above. 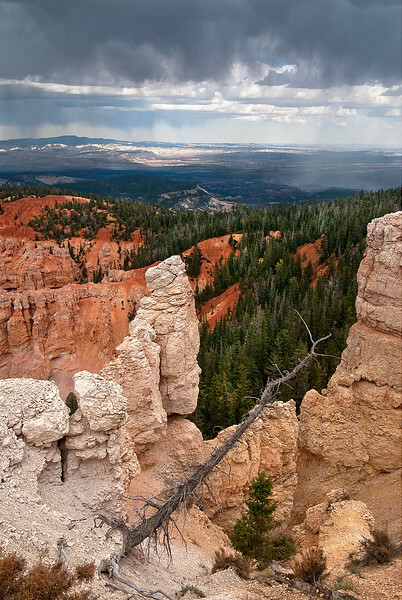 Virga and rain from thunder clouds over the red rocks of Bryce Canyon, looking east from Rainbow Point. 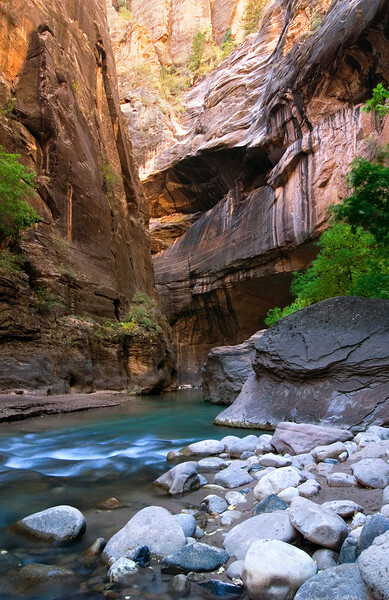 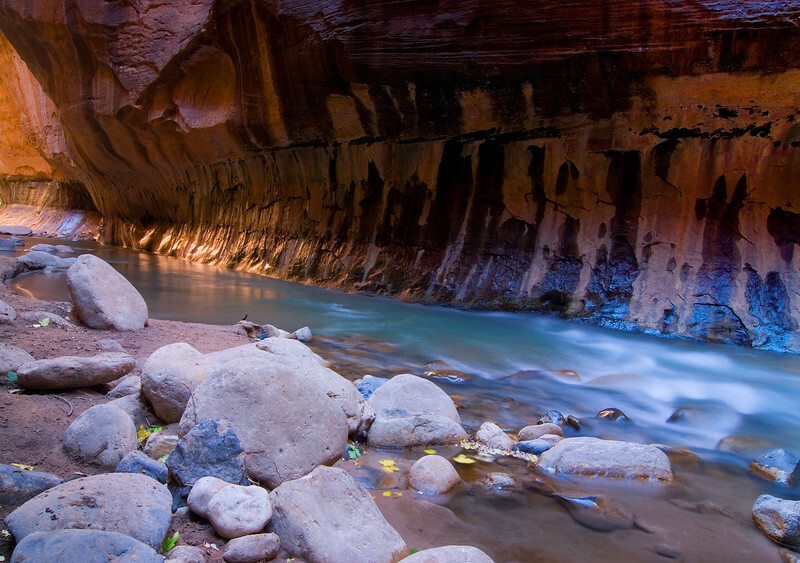 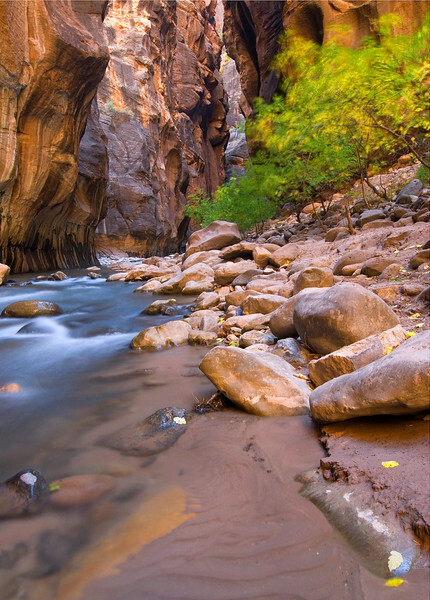 A slight beam of sunlight creeps into this tunnel shaped section of the Zion Narrows as the Virgin River flows by. 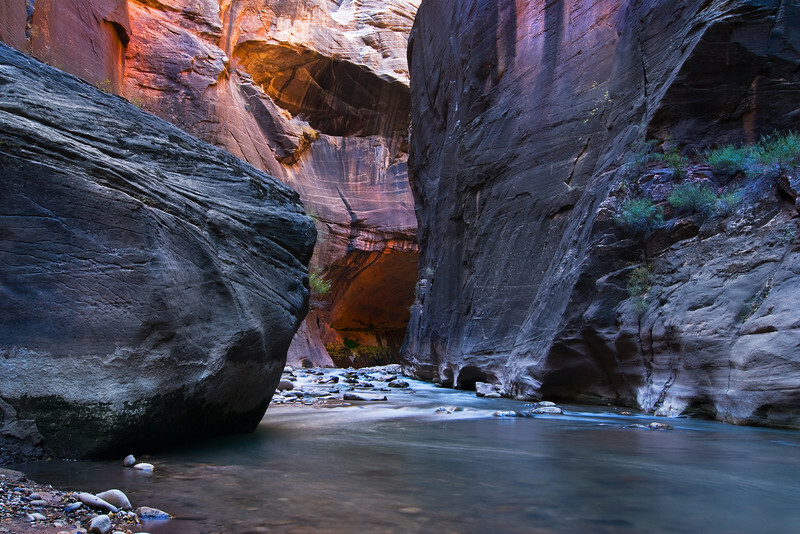 A rather ominous looking section of the Narrows, where you are always wondering what is around that next bend in the river, and you're never disappointed. 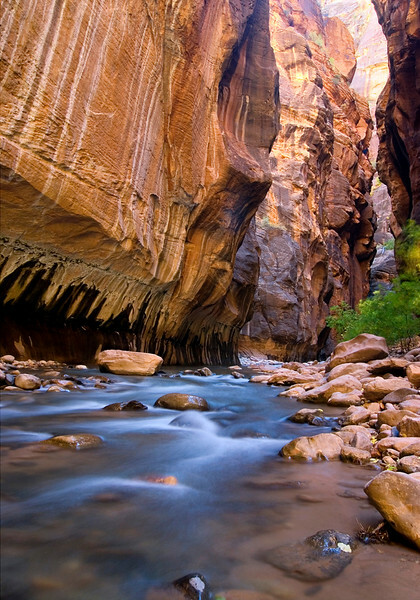 This view gives some impression of the height and complex textures of the canyon walls on a hike down the Virgin River Narrows of Zion. 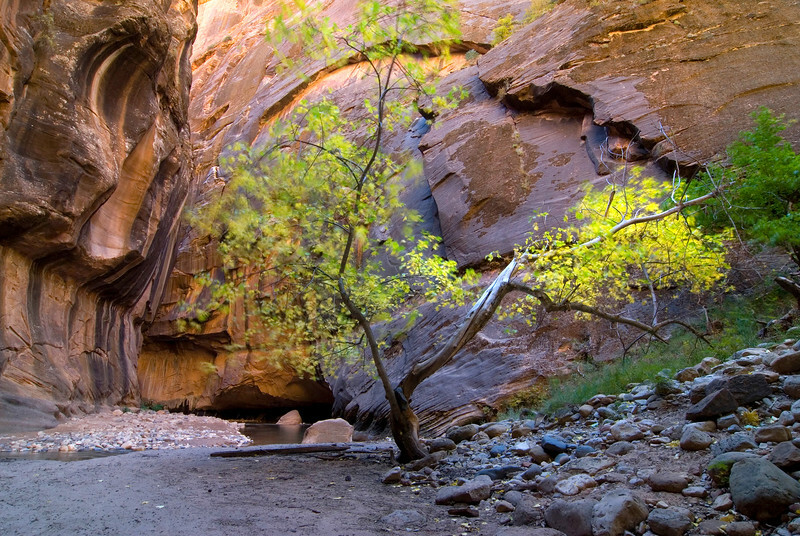 Somehow these cottonwood saplings manage to cling to some foundation between the rushing water and the sheer walls her in the Zion Narrows. 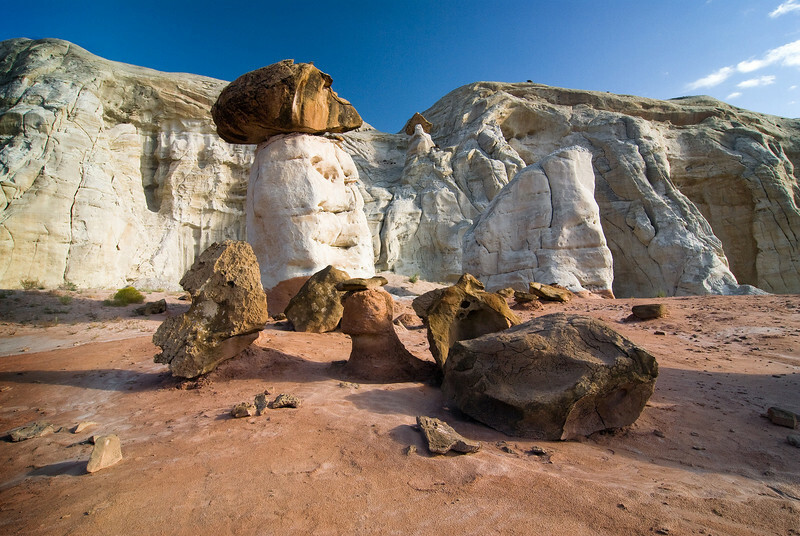 The textured rocks in eastern Zion are unique to that area and very fun to photograph, because you can easily climb around undisturbed and at will to find lots of interesting compositions, just a few minutes from the main road. 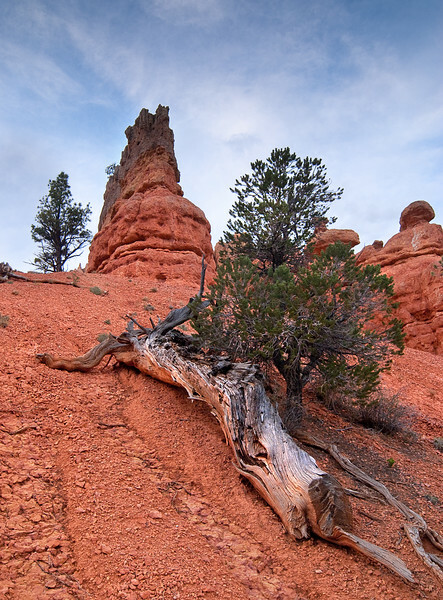 The light and colors at Bryce Canyon have their own special quality, especially the play of light and shadow in the afternoon as storm clouds develop. 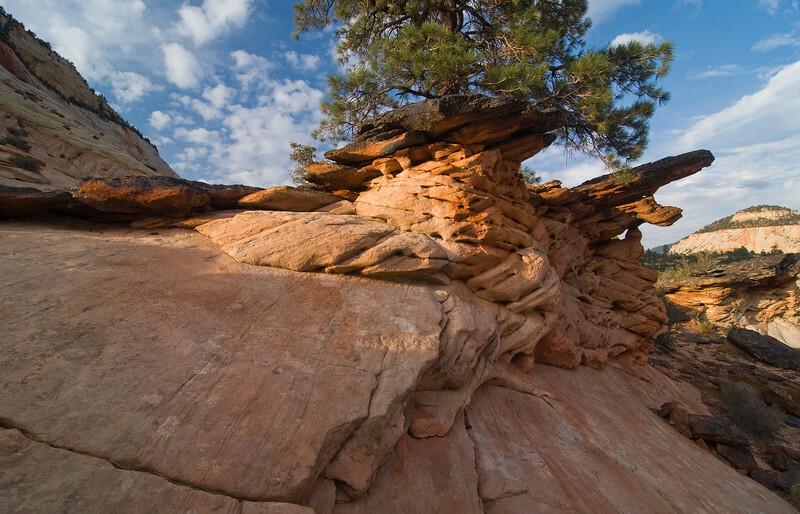 An evening climbing around the rocks on Checkerboard Mesa in the eastern section of Zion produced this example of shapes and textures working together to result in a harmonious whole. 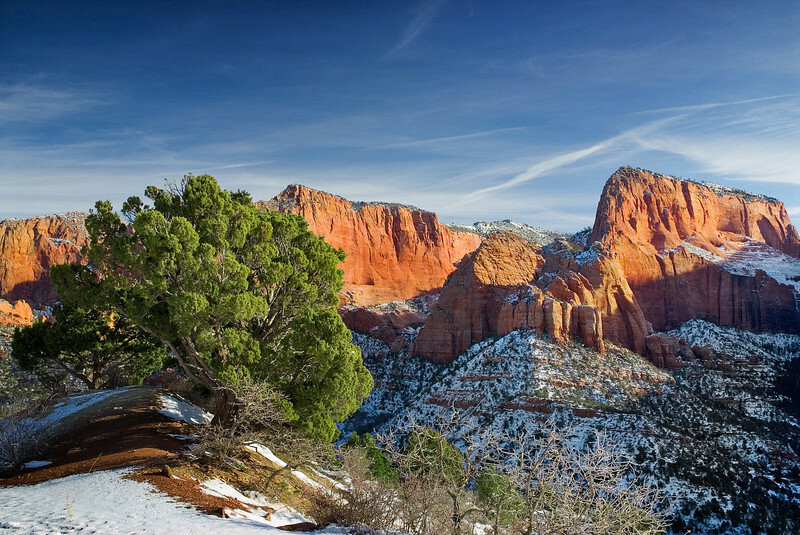 Early sun and a cold winter sky above the red canyon walls of Kolob Canyons, a much less visited area in the northwest section of Zion. 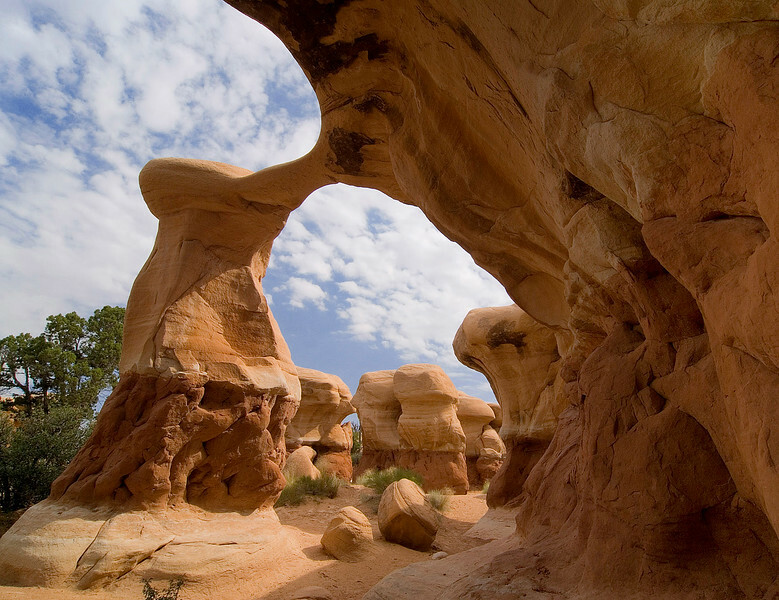 A very wide angle lens got me this view from right under Metate Arch, south of Escalante, Utah. 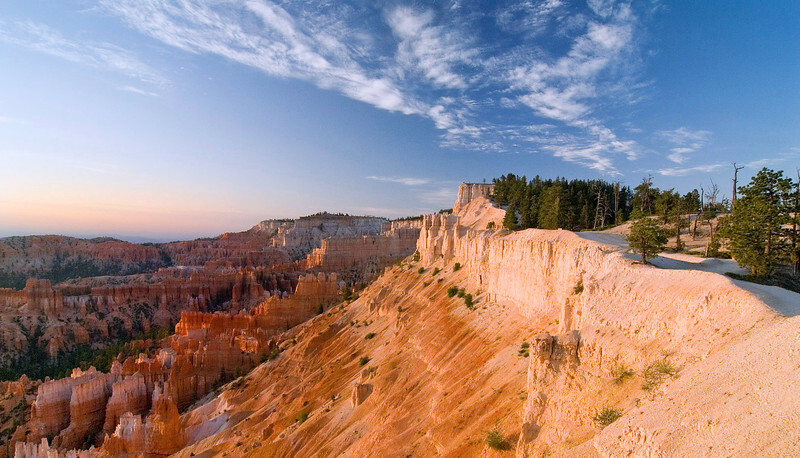 An early morning view of Inspiration Point at Bryce Canyon, Utah. 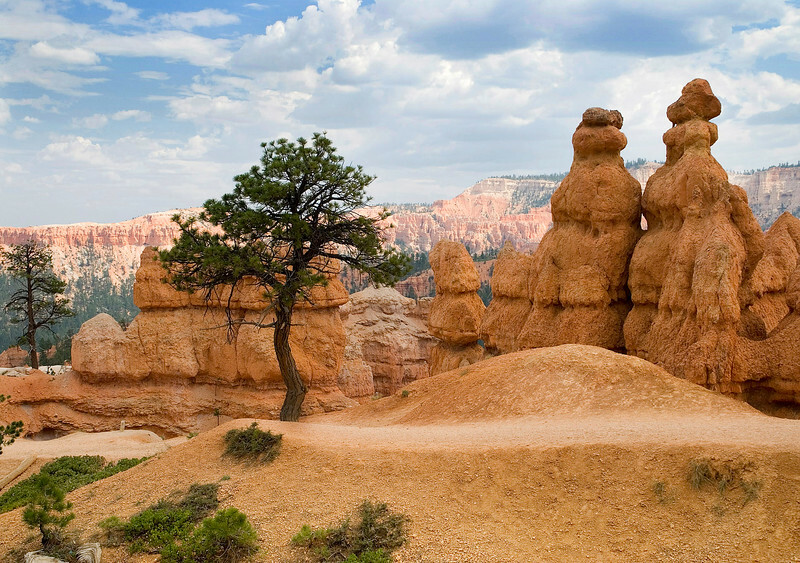 Chess piece-like hoodoos stand next to some tough little trees inside Bryce Canyon. 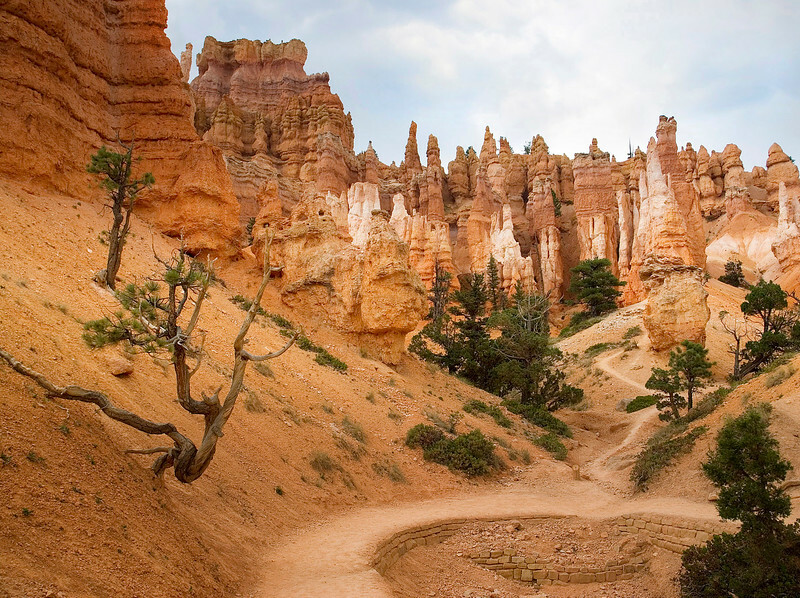 Seen from inside, Bryce Canyon is a fantasy world of colors and shapes. 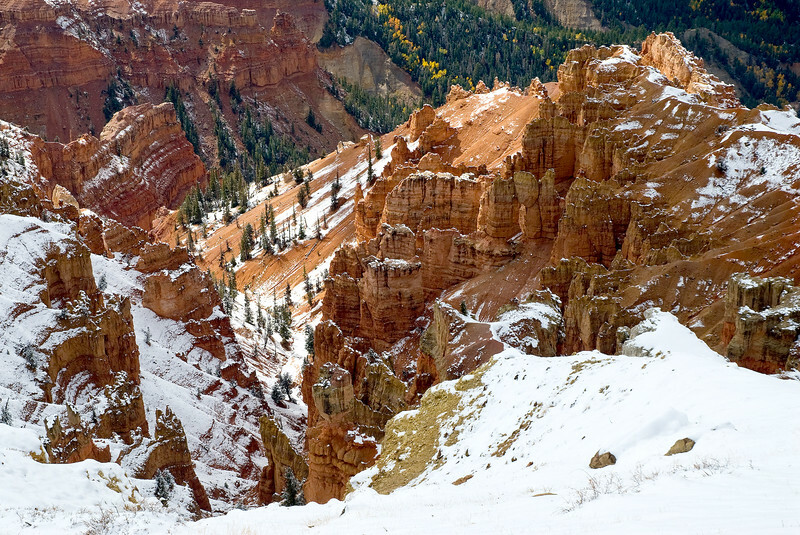 The smooth red and white soils of the Queen's Garden section in Bryce Canyon make for a different appearance than the rest of the canyon area. 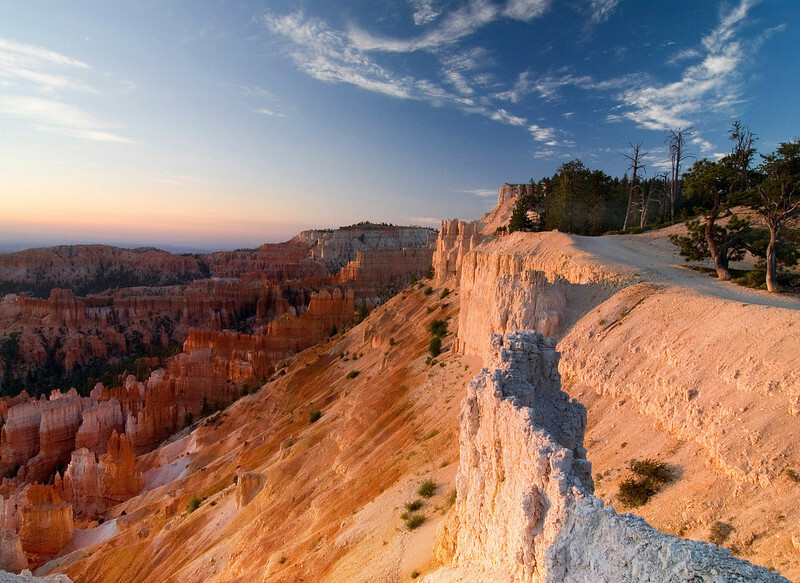 Morning rays n the hoodoos of Bryce Canyon as the horizon changes color with the rising sun. 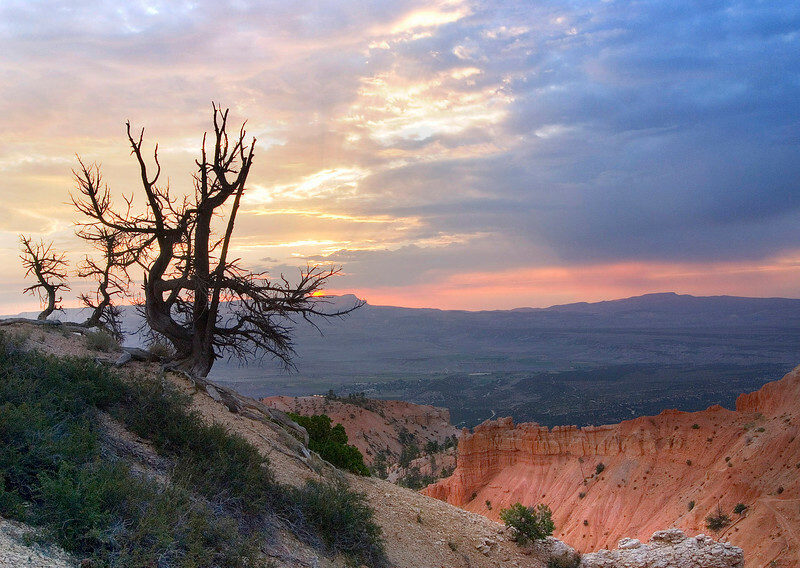 A fiery sunrise seen from Bryce Canyon. 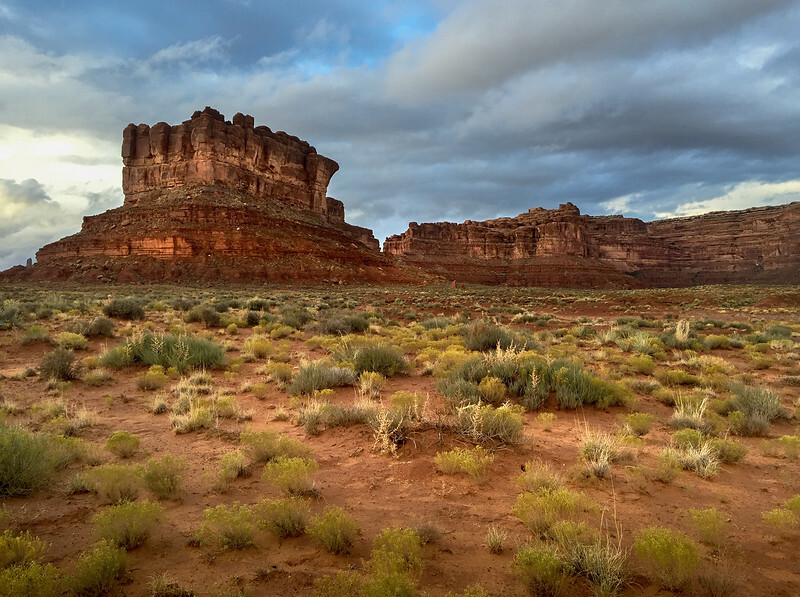 Wildfires to the south, in Zion, added smoke and particulates to the air and I believe the probably enhanced the variety of colors in the sky on this day. 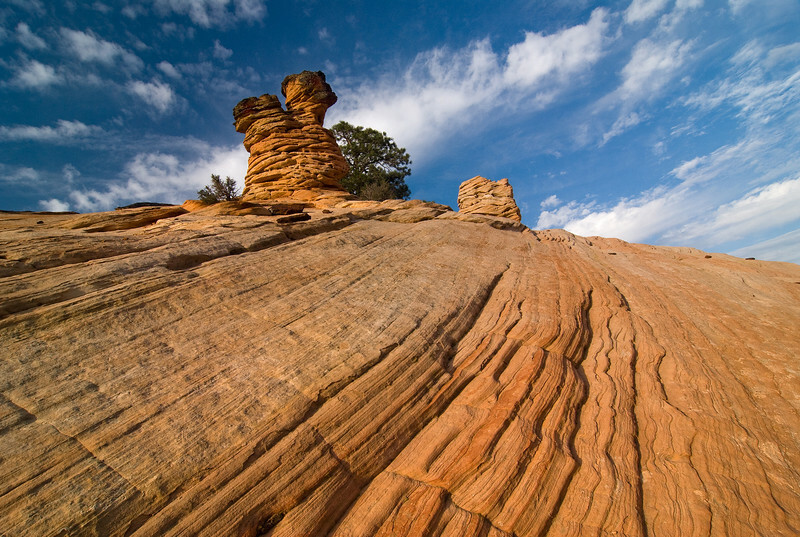 Some oddly eroded formations in the evening light at Checkerboard Mesa in eastern Zion N.P. 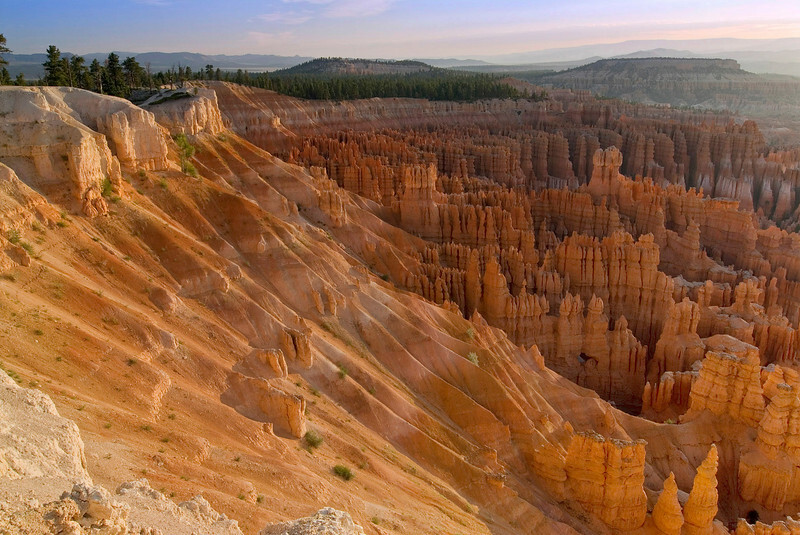 This section of Bryce Canyon looks quite different than the norm and very much like some other planet. 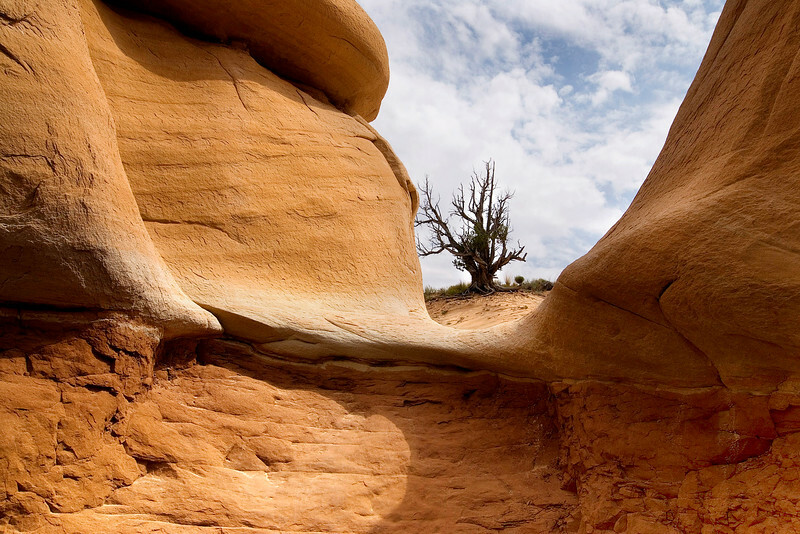 A tight space in the eroded red rocks of the Grand Staircase National Monument provided this view to the outside. 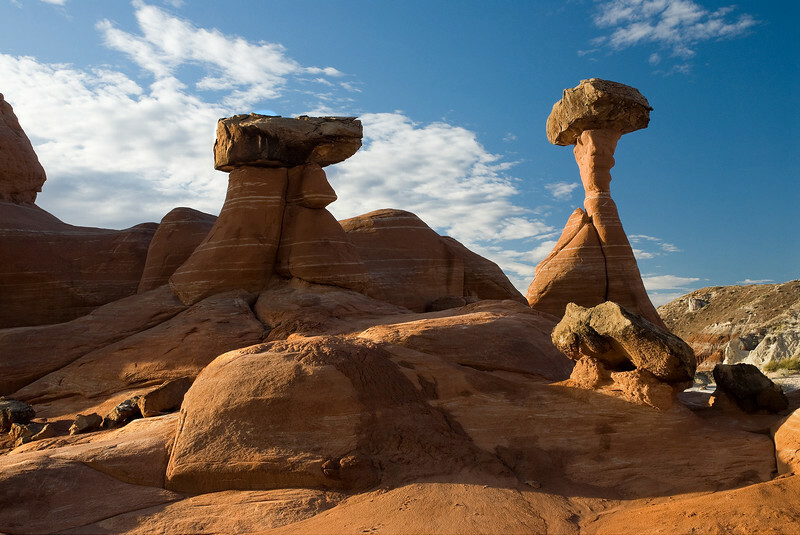 These capped hoodoos are often found with white bases and dark caps in this area, but these are all a striated red rock composition. 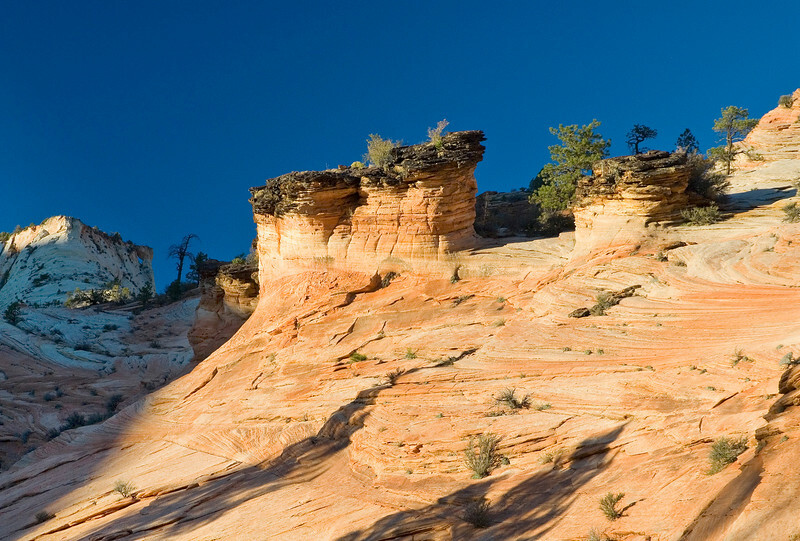 Soft, morning light filtered by high thin clouds provided the dreamy effect in this view, which also demonstrates how the different colors and composition of rock erode into such interesting formations. 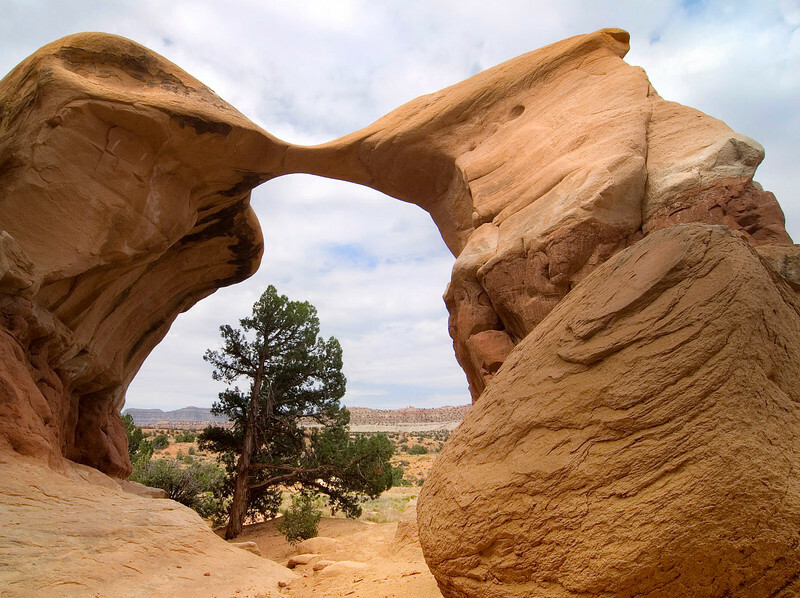 This view is through Metate Arch in the Devils' Garden south of Escalante, Utah. 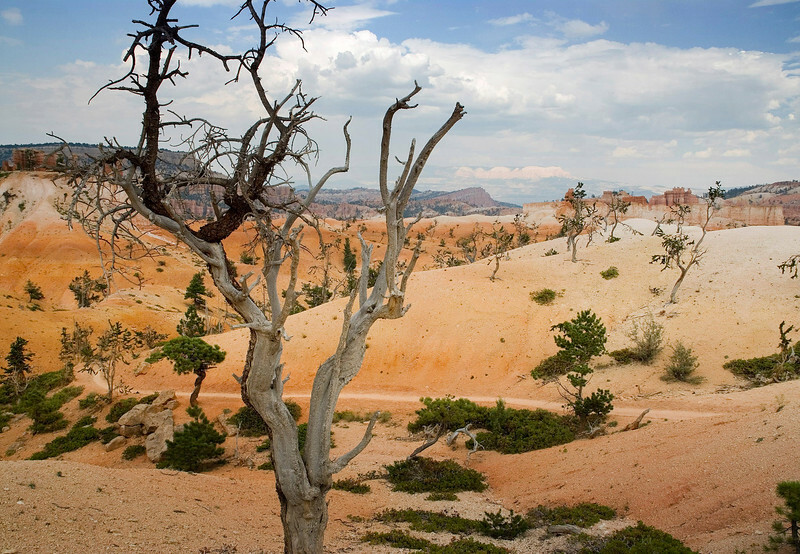 Red Canyon, just west of Bryce, is often passed by on the way to the "big" canyon, but it's one of my favorite places to stop and wander around. 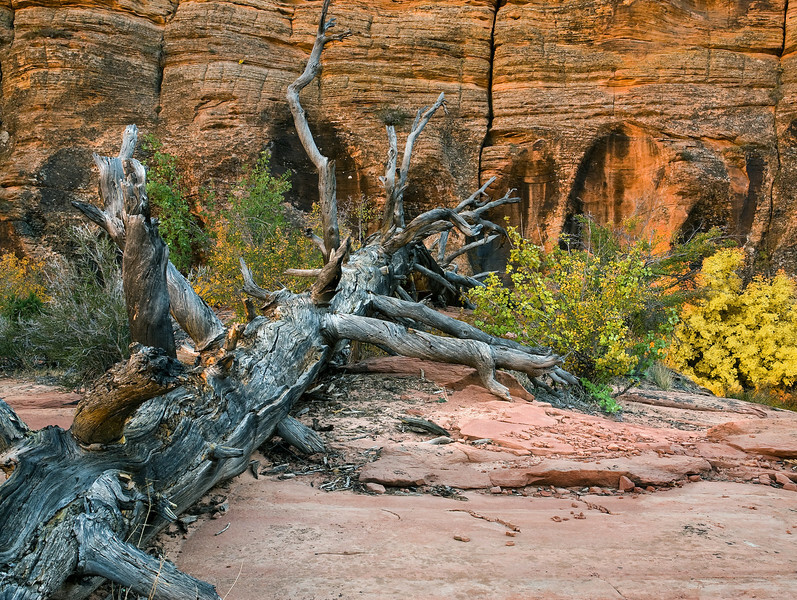 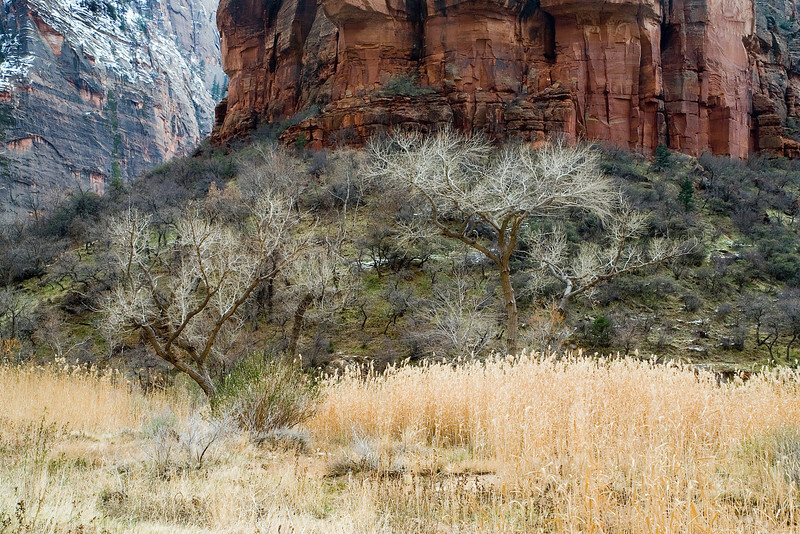 Tall, sheer canyon walls of red rock in the eastern section of Zion provide the back drop for this gnarly deadwood with fall foliage for accent. 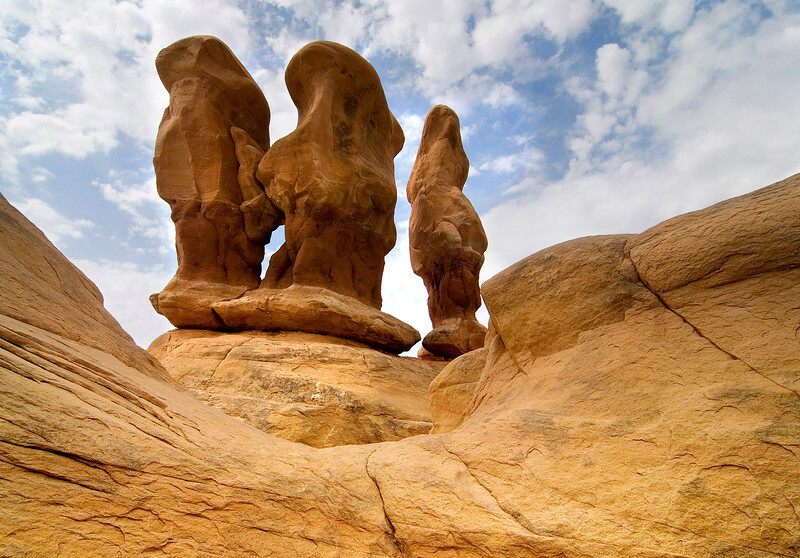 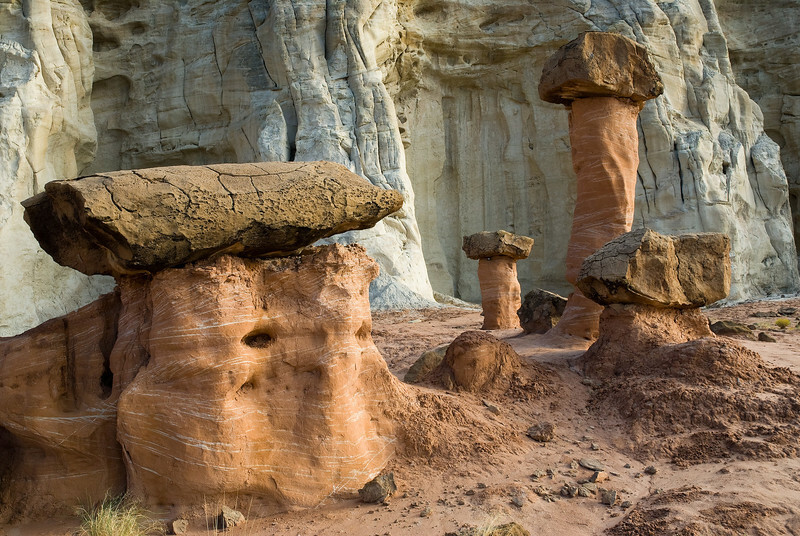 These odd formations are some of the many found south of Escalante, Utah at Devil's Garden on the Hole in the Wall Road. 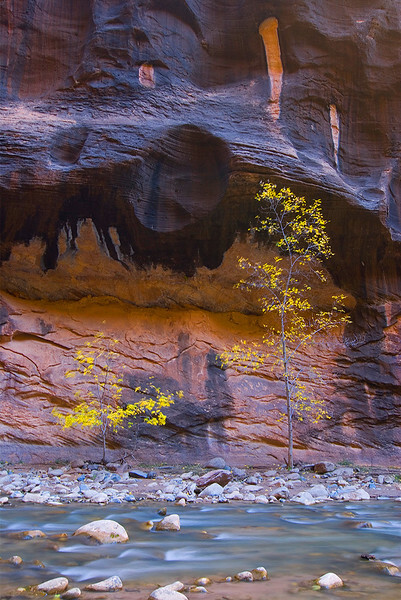 The small trees that manage to survive in the unpredictable conditions of the Narrows just starting to change into their fall colors against the tall sheer walls of the slot canyon.